The WZ-132-1 is a Chinese tier 10 light tank. The Chinese experimental vehicle that united various Type 62 modernization projects. The name is conventional. No prototypes were built. One of the ideal "Light Mediums" in WoT, it has quite reasonable protection (and a lot better than others LT's) with a very tough turret and all-around spaced armor to effectively protect it from HEAT and HESH rounds. This tank is excelled at fire supporting role, as well as taking some punishment with its turret armor before retreating. The WZ-132-1 marks the end of its Chinese light line. After the development of the WZ-132 light tank was finished, a line was drawn and the project proved to be too technical for the Chinese army to produce at the time. As a result, the Chinese army command proceeded to implement the WZ-132 mechanisms in Chinese tanks already in use, the base vehicle chosen being eventually the Type 62 tank. 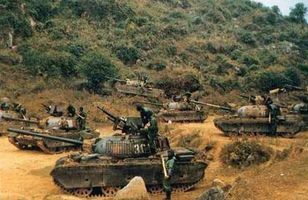 The new modernised variant was named Type 62-I, and was a result of the experience gathered during the Sino-Vietnamese War. Also known under its industrial designation, WZ-131A, it featured 33 different improvements including an external double lens laser range finder mounted above the mantlet of the 85 mm Type 62-85TC rifled main gun for better firing accuracy and a shield for the 12.7 mm Type 54 anti-aircraft heavy machine gun. A late model of the Type 62-I was fitted with external turret storage racks and hull sideskirts for additional protection against HEAT projectiles and anti-tank missiles. This is the model known in-game as WZ-132-1. Late model of Type 62-I, represented as WZ-132-1. This page was last modified on 28 February 2019, at 06:49. This page has been accessed 23,574 times.